You! Seriously, anyone can submit a proposal. TypeCon is a submissions-driven conference: our program is enriched by the innovation, interest, and intellect you can bring to it. If you have something to share (and we know you do!) please submit a proposal. First-time speakers are welcome! If you’re not sure how or what’s involved, keep reading below (and download our handy-dandy Submissions Guide). If your proposal is accepted, you will receive a free full conference registration. You’ll also receive access to an exclusive meet and greet reception for speakers, workshop leaders, keynote presenters, and industry influencers. Additional discounted passes are available for spouses, partners, and guests. You’ll also receive some great swag and bragging rights, too! 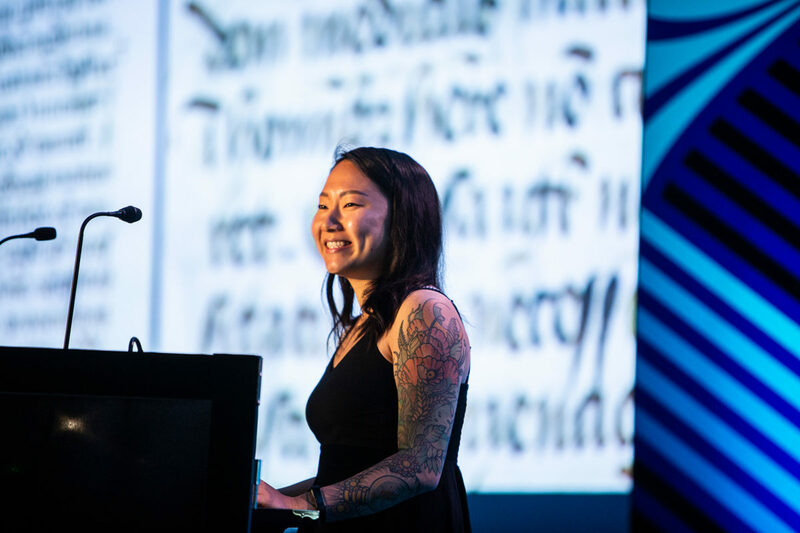 TypeCon offers several programming options for you to consider: 20-minute Main Program presentations; 20-minute Education Forum presentations; half-, full-, or two-day workshops; guided tours and field trips; exhibitions; and other type-related events. Have lots of ideas? We’re all ears: there is no limit to the number of proposals you may submit. Tell us what’s on your mind! This year’s Main Conference Program will take place on Friday, August 30th; Saturday, August 31st; and Sunday, September 1st. For both speaker and audience comfort, Main Conference presentations are limited to 20 minutes, including time for audience Q & A. Previous presentation topics have explored a wide range of topics including medieval blackletter calligraphy, font marketing, and non-Latin writing systems. We look for subject matter that will be appealing to typographers, designers, lettering artists, calligraphers, printmakers, educators, students or other “letterheads” who will be attending the conference. If you’re passionate about about your topic, chances are TypeCon attendees will be too. For more information, download our Submissions Guide. The Type & Design Education Forum, produced for educators by educators, will take place on Thursday, August 29th. This “Ed Forum” provides a unique opportunity to share and learn from our fellow colleagues in a more intimate, all-day setting prior to the main conference program. Here, you can find inspiration, network, and discover new friends. Ed Forum presentations are limited to 20 minutes, plus time for audience Q & A.
Teachers/Mentors: Presentations describing the work and life of a special teacher or mentor, and how this person has been an influence on your own work and teaching. Who is your unsung or well-known hero? Teaching: Presentations on innovative teaching in typography and design. Students: Presentations on a thesis project by recent or current students describing the process undertaken to acquire a topic as well as the method of development of the thesis, and the (visual) outcomes. This year’s pre-conference workshops will take place on Wednesday, August 28th and Thursday, August 29th. Workshops should give attendees an opportunity to “get their hands dirty” while expanding their creative, entrepreneurial, and technological horizons. Highly attended events usually involve topics centered around technique or production. Two-day Workshops last 7 hours each (with a break for lunch each midday). Full-day Workshops last 7 hours (with break for lunch at midday). Half-day Workshops are 3.5 hours in length (no breaks). Any events, tours, exhibitions, or attractions showcasing typography, design, or the visual arts in Minneapolis and the surrounding region are welcome. Such events should take place during the conference (Wednesday, August 28th – Sunday, September 1st). Okay, Okay! How do I Submit My Ideas? First, be sure to review our Submissions Guide. Then, gather your thoughts and navigate to our convenient online submissions form. Basic information: Name, affiliation, title, email, phone, social media. Bio: A brief biography for publication, 800 characters or less. Photo: Headshot image, 1200×1200 pixels, black & white preferred. Abstract: Summary of proposed talk or workshop, 1,200 characters or less. Co-presenter: If you have a co-presenter, the above information is required for that person as well. Education Forum: In addition to the above information, a CV and a minimum of 6 supporting images are required for education forum proposals. Workshops: In addition to the above information, you’ll need to include the duration of your proposed workshop as well as the realistic maximum number of attendees you can fairly teach. Remember, if selected, your abstract will appear on the TypeCon website and in the printed program. And as always, you may submit multiple proposals! How Does TypeCon Select Proposals? All proposals are evaluated and scored using a blind selection process by members of the SOTA board as well as independent, non-affiliated individuals. Details regarding the selection process can be reviewed in our Submissions Guide. When Will I Find Out if My Proposal Was Accepted? Applicants can expect to be notified via email in early April, 2019. If you need further clarification or you’re submitting a proposal for the first time and could use some coaching, please contact us. That’s what we’re here for! Is there someone you would like to see on stage at TypeCon? Please email hidden and we’ll encourage them to submit a proposal. Thank you for your submissions, and we hope to see you in Minneapolis!